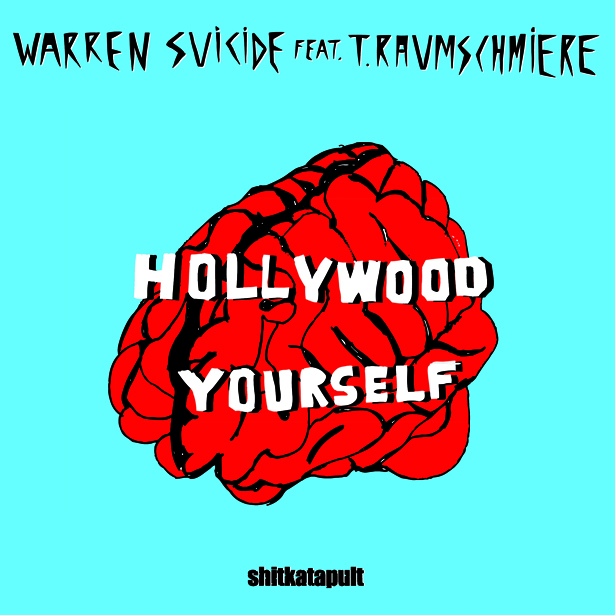 „Hollywood Yourself“, the new single by Berlin music/art duo Nackt and Cherie aka WARREN SUICIDE, is a colourful demonstration of the potential in past, present and future. At the same time, the two songs are a promising representation of their third studio album “World Warren III”, coming out in spring 2011. Assuming from the very straight “Hollywood Yourself” and the galactiv “Moving Close”, we have a lot to expect! Both tracks feature Shitkatapult founder and rock-techno energy master Marco Haas aka T.Raumschmiere on vocals and were recorded live at the Warren Studio “Chez Cherie”. Moses Schneider, well-known for his productions for Tocotronic, Kreator and the Beatsteaks, took care of both songs. Is it the single for the tour or are they touring for the single? Either way, T.Raumschmiere and band are going on tour with Warren Suicide. The whole “Band vs. Electronic, Band vs. Party” idea in general is a concept which all of the mentioned artists work on. But they’re not interested in the boring old-fashioned electro-punk “here we go!”, instead they search for the ultimate level of lust and possibilities. So even before „World Warren III“ is released, we dare say it represents turning away from the duality of techno and rock, towards a third option: it’s different, it’s better, and most of all – it’s neither nor.